Responding versus proofreading in the writing process is an important distinction to make. Proofreading is done right before you create your final draft. It’s when you look for all those pesky errors like run-on sentences and misspelled words. Responding, on the other hand, is done earlier during the revision stage. The emphasis is on organization, concepts, and transitions, in other words, the ideas presented in the writing. After all, isn’t THAT why we write — to express ideas? Not a few times in China, I have encountered a situation that is applicable to the writing process. How am I feeling at that point? Am I flattered that this new friend is impressed by my Chinese? No, actually not at all. In fact, I’m irritated and saddened that she can’t see past my foreignness and my language to listen to what I’m saying. 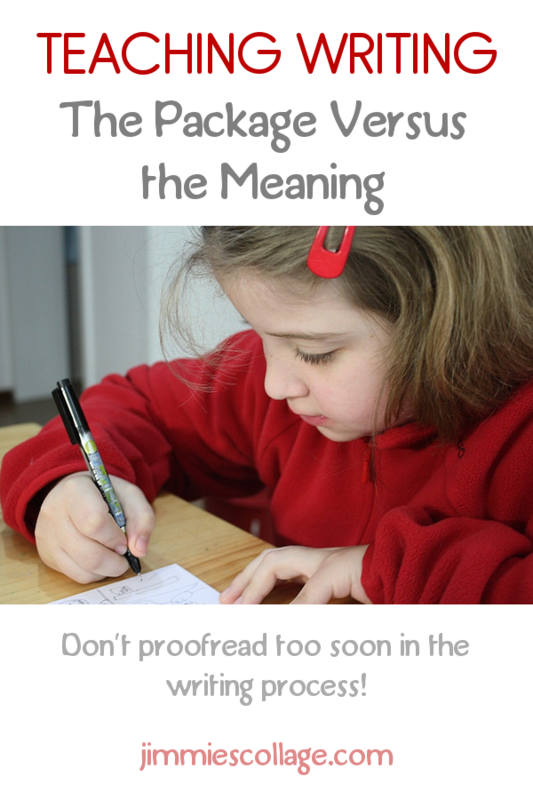 My meaning is far more important than the package – in this case the Mandarin that’s coming out of this blue eyed head (as shocking as that is). I can tell you that it’s a terribly frustrating and even demeaning feeling. So there’s my main point — meaning is far more important than the package. My analogy breaks down in lots of ways, but today as I was reading the The #8 Stumbling Block to Writing over at The WriteShop, this illustration hit me with real clarity. When Sprite pours out her heart in a writing assignment and hands her draft over to me to look at, I have a choice. I can focus on the package — the spelling, the punctuation, the crazy handwriting — or the meaning. When I point out that she spelled TRYED wrong three times, she probably feels the same frustration I feel when that acquaintance can’t see past my blue eyes to my meaning. Your details fit your main idea perfectly! I love how you told the funny story to illustrate your point. This second point needs more meat. It much weaker than the other two points. These words are perfect to express what you’re trying to say. These transition words make your thinking crystal clear. I don’t see how this detail fits your main idea. Why did you arrange the facts in this order? I’m not talking about praise versus criticism. Did you notice that some of these responses were more negative than others? But I addressed her meaning, and that feels good to a child — to any writer, really — to be taken as a valid spokesman. Later once the meat of the meaning has been sorted out, then we can move on to proofreading. That’s when I nit-pick about the spellings and missing commas. By that point, I’ve really tried to understand what Sprite is saying. And then we can focus on the grammar and mechanics. So if my communication story makes you feel sympathy for me, transfer that feeling onto your young writer. Consider his or her frustration when you criticize his handwriting and sloppy margins instead of looking at the expression of his concepts. There is certainly a time for talking about capitalized letters and “change the y to i and add -ed.” But make sure you’re doing that at the right time in the writing process. If you are working with your children on writing (aren’t we all? ), then I do suggest you pop over to The WriteShop’s blog and read some of the series of 10 Stumbling Blocks to Writing. Maybe you’ll get some insights as I did. WOW! Invaluable advice with perfect timing! Thank you so much for taking the time to post this. .-= Melanie´s last blog ..Wordless Wednesdays =-. Excellent!!! What wonderful advice. Thanks for sharing as always. You are such an awesome mom and teacher. .-= Dawn´s last blog ..Happy 9th Birthday, Goldilocks… =-. Thanks for the link. I’ll have to go check it out for later. .-= Ticia´s last blog ..Mailboxes and Dolls =-. .-= Cindy´s last blog ..Unit Studies Revisited =-. Thanks so much for posting this! VERY good. I have just been mulling over these issues with another friend of mine. I’ve got to get better at working with their writing! I’m so paranoid of the CM thought to not allow them to see a word misspelled that I have become a little too insane on that front… what do you do about that? Toss the idea altogether? .-= Amy´s last blog ..A Merry Christmas =-. Great post, Jimmie. I especially love your foreign-language analogy. It illustrates your point perfectly! Thanks for linking over to the blog. I’m looking forward to giving away that $25 WriteShop prize! .-= In Our Write Minds´s last blog ..Owed to the spell checker =-. What lights are going off in my mind – thank you so much for writing this! .-= Emily Darling´s last blog ..Picture-Books in Winter =-. What an absolutely wonderful article! I absolutely loved that you could draw a connection between your experience speaking in a non-native tongue and teaching your daughter to write. Your article was so insightful. I taught at the college level for years and years before I quit working and I always noticed that students were far more upset about receiving a bad grade on an essay/research paper/something they had written than on a test. It seemed that their self-concepts were more tightly bound up with their writing. I TRY to remember that when I am giving feedback to my own children but it is SO HARD sometimes when the grammar and spelling errors are screaming to me from the page. It has taken me a very long time but I am much, much better about giving appropriate comments at the appropriate times than I used to be. Thank you again for such a great post. Bravo! I strive to make my kids good communicators through their writing and part of that is helping them to have good convention while expressing ideas through writing. I especially appreciate the comment about discussing the meaning before the editing. I need to do that with my dd. .-= Marsha´s last blog ..Interlude =-. As a former English public school teacher we used a marking scheme that focused on the objective (e.g. : an exciting introduction/ or clear paragraphs/ or cliff-hanger ending)[out of 10], then creativity [out of 5], then structure [out of 3] and lastly spelling [out of 2] giving a total of 20. This way the emphasis is clearly seen.